What does the term "set over set" mean in poker? What is meant by the term "set over set"? 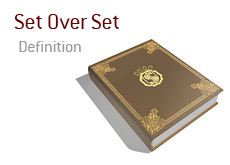 "Set over set" refers to the situation in poker when two players both have "sets" (three of a kind). A "set over set" will almost always result in a very large pot, due to the fact that a set is such a strong hand in poker. Example #1: Action folds around to you on the button. You look down at 7d-7s and put in a standard raise. The SB folds, and the button calls. The flop comes 3d-4d-7c, giving you a set of Sevens. Your opponent checks, you bet, your opposite raises, you re-raise, your opponent shoves and you snapcall. You turn over your Sevens for the set, while your opponent turns over Pocket Threes for bottom set. The turn and river are blanks, and you scoop a sizable pot. This is a "set over set" situation. Example #2: In a multi-table tournament, a player in early position pushes all-in. Action folds around to you in the button. You look down at pocket Kings and make a quick call. 5d-7d-9c, giving your opponent a set of Fives. There is much rejoicing on his part as it appears that he is set to double up. The turn? The King of Clubs, giving you a set of Kings. Your opponent is now down to one out, the remaining five in the deck. The river is the meaningless Qd, and you take the pot with your set of Kings. Your opponent leaves the table, grumbling about how only he could get eliminated from the tournament in a "set over set" situation.